I love having our nephew round it's great to see him and T play and have lots of fun together, but boys being boys, their attention span is not to great. 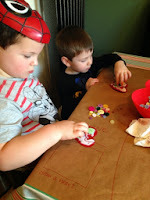 For our valentines play date this year I thought I'd better do some nice and quick activities and crafts. This one was perfect. It was nice and quick and easy and dried in time to be taken home at the end of the session. 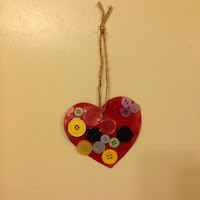 I had already cut a heart shape out of cardboard for each of them. 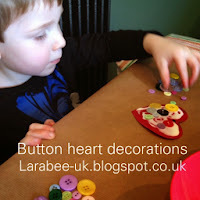 The boys made a hole punch at the top of each heart shape. I gave the boys the glue to spread on themselves, they did a fab job and didn't get it all over the table which I must admit I had half expected! I filled a heart shaped bowl full of buttons and allowed them to pick which they would like. As you can see, they each took out a little handful and made a pile in between them! 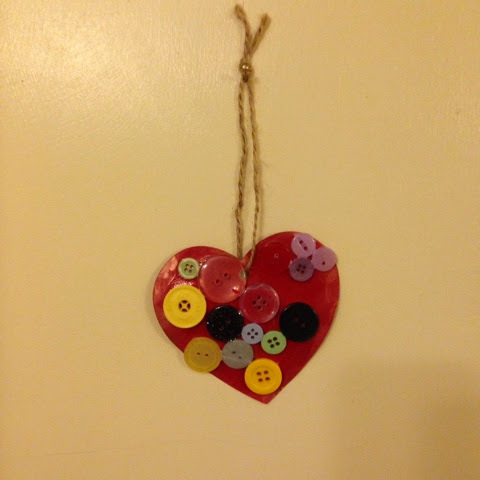 This project was start to finish 10 minutes and I put the hearts on the radiator for the glue to dry, which it was within half an hour. 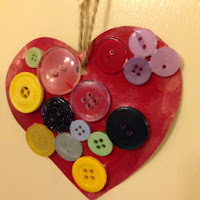 This month we are focusing on love and thanks and will be doing activities, games and creating lots of things to do with hearts, valentines and appreciation. 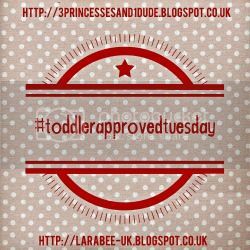 All of our blog posts can be found in one place here we've also got a pinterest board with lots of fab ideas on. These are great, we have a tub full of buttons. I think we will add this to our Valentines play date.